“Sweet” is what it is! The fashionable coral flap and chevron pattern goes with everything. The “Licorice Blossom” bag has a handy ring closure. It can easily be opened single handedly. The sturdy strap inserts into the large ring and folds over itself. It is secured in place with a hook and loop fastener. Made of cotton with a clear coating that wipes off easily. 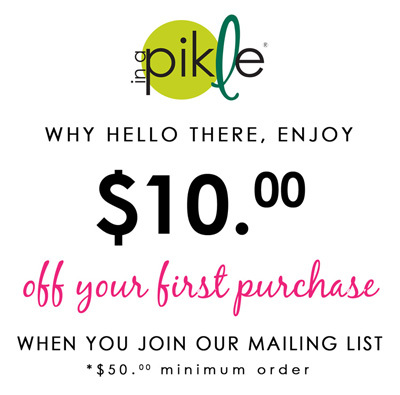 The “In A Pikle” bag is approximately 10″ x 7″ open and 3″ x 5″ when closed. All covers include 4 Double Sided Interior Pouches.